I’m guilty of needing alone time when I get home. It’s my time to just unwind for 5 minutes and get my head out of work and into “Mom mode” as I call it. I help cook dinner, wash dishes, get Lily ready for bed, play blocks or tea party for 45 minutes and then put her to bed after a few books. Afterwards I either watch a show with Zach or go up to our room and read. Zach and I realized as great as it is to be together in the same room watching a show, we aren’t really together. I’m usually on my phone answering e-mails or he’s invested in his show. We realized we needed to do something more productive together. I’m not big into board games but when he suggested that we start a puzzle, I agreed on the idea. We ventured out to Target and bought a puzzle, but you guys, this isn’t just you’re normal puzzle. It’s 2,000 pieces! What have we gotten ourselves into?! 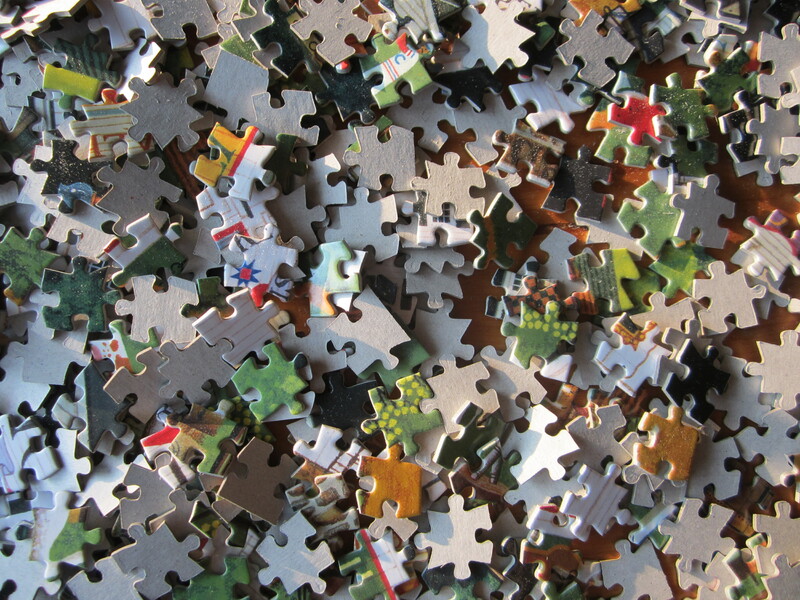 We didn’t realize how much we got in over our heads until we spread the puzzle out over our dining room table and began to sift through the pieces. We each had our own way of going about how we wanted to tackle this project. The communication was eye opening for both of us; as we worked out the best strategy. I’m into organizing so I offered to grab certain sections of the puzzle, label them and put them into bags to help with the clutter ( you all know how much my anxiety levels get out of control when there is a huge mess ). Zach offered to start putting some of those sections together once I had categorized them. 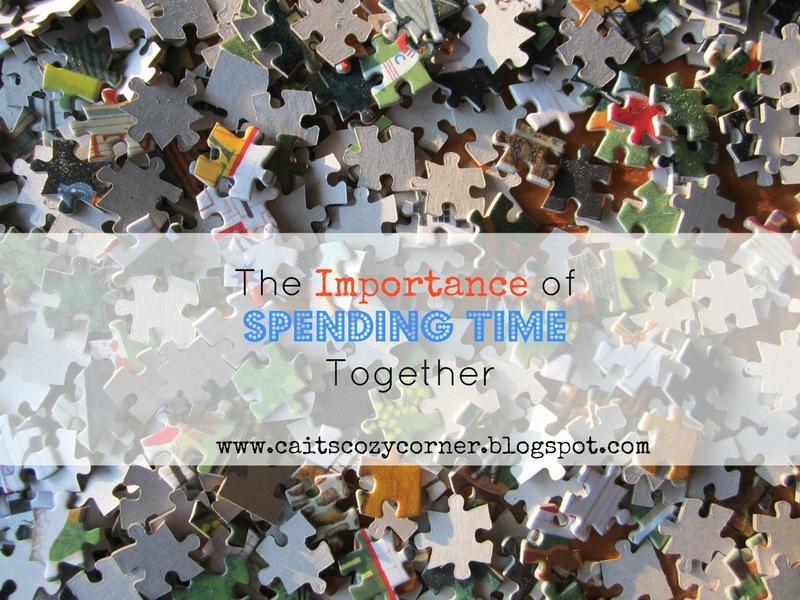 We had turned our phones off while we worked on the puzzle, had fun music playing in the background and enjoyed the time of just being together without social media or entertainment shows engrossing us. We laughed and even multi tasked by talking through obstacles of getting the puzzle finished and having a deadline of when we wanted it to be done. We were spending quality together and it was amazing. I know you’re thinking, really Cait? A puzzle made you feel more intimate with your spouse and I’m here to tell you, yes it did. By having all our distractions out of the way, we were able to focus on one another and that’s important in a marriage or any relationship you have. We’re going on being together for 10 years and we still need to keep the spark alive. Even if it’s doing a puzzle together. Heck, I’m sure we’ll be talking about it when we’re in the nursing home together in 70 years. That's a good idea. I am really bad at puzzles and I'm sure my husband is really good, so this might not be the best idea for my self-esteem haha. But I totally get this and have talked to my husband about this a lot lately too. I feel like I'm in mom mode or cleaning mode all the time and it's hard to switch "off" from all we do and social media to actually connect anymore. I think this is an AWESOME idea and I am copying you and suggesting to my hubby we start a puzzle!!!! I think this is great!!!! That is SO adorable you two did a puzzle like that together... I can't imagine Brandon and I having the patience to do a puzzle. I agree about having alone time that isn't centered around technology. We went on a date last Monday for the first time in months and neither one of us touched our phones the whole time. It was awesome. I love this! We used to do puzzles at Christmas time when all of my extended family would get together in Michigan. I loved it. I think I need to go buy a big puzzle! My husband and I do puzzles together! It's a nice time to sit back, relax, have a chat, no tv, no internet. I find we do most of our puzzling from October to Now, mid-February, as once it's nice outside we head to the garden! Oh, btw, we did that puzzle. It's hard. once you finish the castle, it is not as fun anymore! It's funny that I saw this because my boyfriend and I were putting a puzzle together and he kept saying how I'm a terrible puzzler haha! That puzzle idea is genius!!!! You bring up a lot of great points, and I love that it was a no phones/no distractions "date"! This is such a great idea! We are so guilty of being in the same room and not paying attention to each other. I feel like we're always go, go, go and there's always something to do (I'm on my phone a lot doing things in the evening or reading too) but I can definitely see how this would be a great thing to do, even just once a week and make something like this a priority. I love this! I can so relate to spending time with yourspousebut not really SPENDING time with your spouse! We are totally guilty of it!